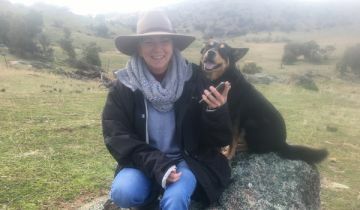 Central West farmer Marian McGann is helping farmers sleep better at night by developing an app that counts and records their stock numbers while they’re out in the paddock, with support from the NSW Government’s Business Connect program. Ms McGann, who has a 2,000 hectare sheep farm with 7,000 fine wool ewes at Wyangala, said she came up with the idea after an ordinary day in the sheep yard sparked a family discussion about the difficulties of getting an accurate sheep count. 'We had sheep stolen seven years ago and it nearly broke the farm. So I went home that night and decided to develop an app to solve the problem,' she said. After coming up with the idea for the app Marian called on the help of Business Connect advisor Russell Meadley who quickly connected her with Bathurst developer Appiworks to create the MyPocketMate Stock Keeper app. Russell also assisted Marian in securing a $25,000 Jobs for NSW Minimum Viable Product grant to fund the development of the app. Marian said she designed an app to keep records on livestock events and tallies and commissioned Appiwork at Bathurst to construct the app with a web portal. 'The app and synchronised web portal creates records on livestock activity – making it a powerful reporting and decision-making tool for the farmer,' she said. Business Connect advisor Russell Meadley said MyPocketMate was a great example of how the NSW Government’s $30 million Business Connect program was helping regional businesses across NSW. Business Connect advisors are experienced professionals who provide confidential and independent advice from the NSW Government. Advisors have experience running small businesses themselves and have formal qualifications in business-related disciplines. In the period July 2017 – June 2018, the Business Connect program has assisted 10,800 small businesses, offered over 48,000 hours of face to face advice or training and held over 660 events. Business Connect is there to help all NSW small businesses wherever they are in the state. Small businesses can connect with experienced advisors who can help with marketing, business planning, social media and innovation. I encourage anyone who wants to start a business or grow their existing business to contact a Business Connect advisor and make an appointment.